In addition to cooler, quieter computing, the SanDisk Ultra II SSD includes proven shock and vibration resistance to protect your drive. 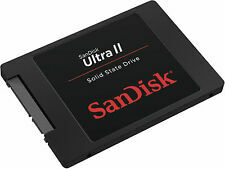 SanDisk Ultra II 240GB SSD (refurbished). SanDisk products are constructed to the highest standards and rigorously tested. In addition to cooler, quieter computing, the SanDisk Ultra II SSD includes proven shock and vibration resistance to protect your drive. SanDisk Ultra II 480GB SSD (manufacturer refurbished). SanDisk products are constructed to the highest standards and rigorously tested. 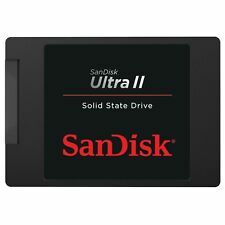 SanDisk Ultra II 960GB Internal 2.5" (SDSSDHII-960G-G25) SSD *102 hours! Up for sale is a lightly used SanDisk Ultra II 960GB Internal 2.5" (SDSSDHII-960G-G25) SSD. Power on: 102 hours. I have multiple of these, so you will receive one in similar condition as shown in the pictures above. SanDisk Ultra II 960GB Internal 2.5" (SDSSDHII-960G-G25) SSD *8 hours! Up for sale is a like new SanDisk Ultra II 960GB Internal 2.5" (SDSSDHII-960G-G25) SSD. These drives will have been powered on for a maximum of 8 hours! I have multiple of these, so you will receive one in similar condition as shown in the pictures above. No drive included. Bought from TigerDirect in Nov 2015. Never opened. Enclosure is warrantied until Nov 2018. 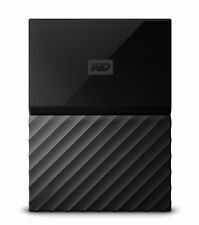 Product Title WD My Passport WDBYNN0010BBL-WESN 1 TB Hard Drive - External - Portable (WDBYNN0010BBLWESN). Western Digital WDBYNN0010BBL-WESN 1tb My Passport Ultra Blue. 1TB My Passport Portable Hard Drive. Ultra Aluminus. USB 2.0 SLIM HARD DRIVE ENCLOSURE. Part Number. No PO Box’s. More Product Information for the Western Digital 1TB My Passport Ultra Wht Gld. Easy to use, just plug it in to start saving and backing up. This brilliant design fits comfortably in the palm of your hand, pocket or purse so you can easily carry the content you love anywhere you go. Ultra Aluminus. USB 3.0 Super-Speed Portable Hard Drive Enclosure. Part Number. No PO Box’s. Used for one month. Works great. Does NOT include screws or bracket--just what was in the box. This sale is for one used SanDisk Ultra II 960GB Internal 2.5" SDSSDHII-960G-G25 SSD. Enclosure – Portable Docking. HDD/SSD - USB 3.0. ULTRA U12-43850. Supports 2.5" SATA I/II/III. Capacity 36GB. Interface Type Ultra320 SCSI. Rotation Speed 15,000RPM. Silicone inlays for vibration and shock reduction. USB 2.0 interface 480 Mbit/S. Supports 2.5" SATA SSD/HDD (9.5 mm high). Plug & Play / Hot Swappable. Upgrade your computer’s storage with this 500GB SanDisk Ultra 3D solid-state drive. read and 530MB/sec. write speeds of this SanDisk Ultra 3D solid-state drive. 500GB storage capacity. SATA III interface. Dell 53MUF 18.2GB Ultra 3 10k 80 Pin. Enterprise IT Products. Vibrant Technologies focuses on Enterprise IT Hardware sales. Substitute Part Numbers. THIS IS A VERY NICE ULTRA EXTERNAL SATA OR USB 3.5" SATA HARD DRIVE ENCLOSURE. IT WAS REMOVED FROM A WORKING SYSTEM. THE CD WILL BE INCLUDED ONLY ON REQUEST BECAUSE IT IS ONLY NEEDED FOR A WINDOWS 98 DRIVER. Ultra-fast transfer rates - When connected to a USB 3.0 port, My Passport Ultra lets you access and save files in blazing speed. Travel light with all your digital content. Product Line My Passport Ultra. Hard drive hot swap bay. Fits 3.5" ultra slim hard drives. ULTRA PRODUCTS 2.5" ALUMINUM USB 2.0 HARD DRIVE ENCLOSURE IS PRE OWNED BUT SHOWS HARDLY ANY SIGNS OF USE/WEAR HARD DRIVE ENCLOSURE IS IN EXCELLENT CONDITION HAS BEEN TESTED AND FUNCTIONS PROPERLY. Double soft buffer layers keep your hard drive's case free of scratches. Case is made of superior hard EVA for durability. 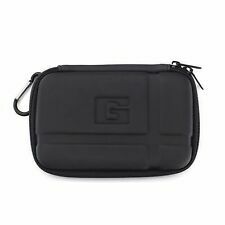 Durable: Smooth but strong zipper for easy Opening and Closing. Unbreakable steel hook allows you to hang it on bags. Hard Drive Capacity: 300GB. Hard Drive Type: SCSI. Caddy Included: Yes. Hard Drive MFG By: HP. Hard Drive PN: 404701-001. Hard Drive Size: 3.5". Tested for Key Functions, R2/Ready for Resale. Ultra USB 2.0 Portable Hard Drive Enclosure (U12-42061). 7.5GB AT FIREBALL ULTRA IDE HARD DR.
Used, in good shape, tested and works, wiped and showed the correct size (a little less than it's listed size so under 20 GB) in explorer. This is an old IDE drive! Be sure to remove or put the jumpers in the correct position before using. The shrink wrap even has the Maxtor logo printed on it to ensure product authenticity. Seagate Ultra ATA/100 300GB 16MB Cache Internal HD ST3300631A-RK NIB. Condition is New. Shipped with USPS First Class Package. The Seagate FreeAgent GoFlex external hard drive is fully compatible with Seagate GoFlex storage systems for maximum integration. You can use this plug-and-play external hard drive straight from the box to interchangeably access files on PCs and Macs alike. SESGATE Internal Hard Drive 200GB. ULTRA ATA/100 7200RPM/8MB CACHE. Condition is New. HP BD07286224 HD NO CADDY 72.8GB 10K RPM WIDE ULTRA 320 80 pin SCSI SHIPS FREE! HP BD07286224 Server Hard Drive NO CADDY. WIDE ULTRA 320 80 pin SCSI. 10,000 RPM. HP PN: 300955-015. Pulled from a retired server. Tested and Functional.